गोरी गोरी बैंया, श्याम सुन्दर. 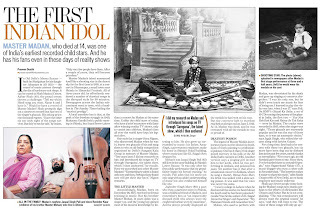 गोरी गोरी बैंया, श्याम सुन्दर..
Forgotten voice: Master Madan - His music added. aap bahut sarahaneey kary kar rahe hain. par pata nahin jo gaane aapane upload kiye hain use sunane me pareshaani ho rahi hai in saari rachnaon kaa RPM bahut hi teiz hai, pata nahin ye meri dikkat hai ya sabki? क्या गज़ब का काम किया भाई जी. मास्टर मदन के बारे में पढ़ा था, बहुत-बहुत पढ़ा था, मगर सिर्फ़ पढ़ा था. कभी सोचा नहीं था कि उनकी आवाज़ सुनने को मिल सकेगी. आपने सम्भव कर दिया. आपकी यह प्रस्तुती तो लाजवाब है. हम सभी संगीतप्रेमीयों के लिये उपकार हैं. ईश्वर आपको खुश रखे. कल ही दिल्ली से मास्टर मदन का नौवां गाना मिलने की खबर आयी है, जो संभव नहीं लगता. अब चेक करना संभव है.इसलिये फ़िर से धन्यवाद!! मैंने बड़ी कोशिश की , link down load करनेकी ..मास्टर मदन जी के गीत सुनने के लिए ..'error' दिखा रहा है बार बार ..पता नही क्यों ? you shall be remembered as the person who re-introduced great master madan to the world. all the music lovers shall be for ever indebted to you. I appreciate by heart.. we should encourage the people who are trying to restore our lost artists into existence.. fantastic song.. i had heard only 2 songs before.. lovely. I have also got all these songs in youtube.com. thanks to all.. The two famous songs are easily available. The rare 6 songs were found by Vijay of thumri.com You can download all from the link given above. mein ne links se songs download karne ki bahut koshish ki lekin kuch garbar hai. file download nahin huwee. If someone can help me.. and send the sound files on adil9p@yahoo.com i will make all good wishes for him. no doubt abt your marvelous work.Indeed it's a kind of surprise to all of us those love music and urdu poetry.Sahi hii hai ki lajawab cheez ko Allah tala jyada din gandi duniya mein nahn rakhta hai. Thanks for Such Medoly Song.---- Shiv lal Udr. You have done a great job to create something beyond measure! Master Madan Sahab is undoubtedly a legendary figure whose natural but mesmerizing voice would ever rule the hearts of people!!! Songs download nahi ho rahe..krupaya madad karein kaise hon aasaani se? Dhanyvaad. While after every effort of downloading, always shows error. I am helpless. Please help. I will be grateful, if someone could send me all 8 songs on kangysingh37@gmail.com or my WhatsApp number 91+9555608877. Thanks a lot.